Environmental, cultural and social stewardship are not just compatible with business success - they are essential to it. At IEG, we contribute our technical expertise and resources to help improve ecological, cultural, and social wellbeing through donations and volunteer efforts. As part of this commitment, we will also consider reduced rates or in-kind support for projects that align with our values, vision, and interests. IEG is registered as a corporate member of the “1% for the Planet" program. Members give 1% of revenues directly to any of the approved nonprofit environmental organizations in 1%’s network. We believe it is important to give back by volunteering in our local communities. Justin sits on the Board of Directors of both British Columbia Tomorrow and Alberta Tomorrow. He is also a member of the Professional Advisory Group of the University of British Columbia Professional Master of Land and Water Systems Program. Ann volunteers for the Switzmalph Cultural Society which has a mandate to sustain, regenerate and nurture the environmental, economic and cultural needs of the Neskonlith community. 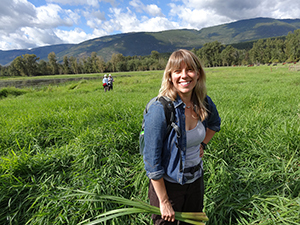 Ann’s Master’s degree focused on restoring a culturally valuable traditional plant, ckwalkwalul's or wapato (Sagittaria latifolia), in the Salmon River Delta. In ongoing support of the Secwepemc community, Ann volunteers her time with the SCS which also supports the legacy of the knowledgeable and beloved Neskonlith elder Mary Thomas, from whom Ann had the privilege to learn. 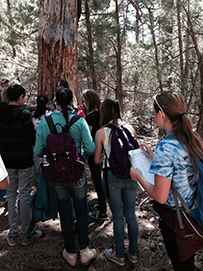 Shanti volunteered to teach students at the Albuquerque Middle School program about lichens and biodiversity at the Sandia Mountain Natural History Center. She also volunteered for the Northern New Mexico Expanding Your Horizons Conference, which is designed to motivate and introduce young women in grades 5-8 to science and mathematics. Shanti donated hundreds of identified and curated lichen specimens to the University of New Mexico herbarium for student educational use. IEG also participates in the National Science and Engineering Research Council (NSERC) Industrial Postgraduate Scholarship program. IEG provides support through NSERC to fund graduate student research, and to date has provided $23,000 to graduate students in 2013-2014. IEG has collaborated with two University of British Columbia professors, Dr. Cindy Prescott, and Dr. Sue Grayston, both part of the University of British Columbia Belowground Ecosystem Group.If you are a student interested in working with IEG, we look forward to hearing from you. IEG undertook a comprehensive assessment of our corporate carbon footprint (direct emissions, purchased energy, air travel, etc.). This assessment was used to track our carbon footprint over time, to help identify areas of potential reduction, and to provide metrics for participation in carbon offsetting programs. We have contributed to air travel carbon offsetting for years, and we participate in the Cowichan Valley’s Community Carbon Marketplace (CCM). The CCM directs offsetting dollars back to the communities where they originate and monetizes locally-generated carbon credits, building community resilience. In 2014, IEG purchased 70 tonnes of carbon credits through the CCM . In 2015, we reduced our direct and indirect carbon emission and purchased additional offset credits through CCM.